(Small rant) I want to start off by saying this recipe did not want to allow me to be great. Let me start off by saying that this recipe was weeks in the making. In my latest Dollar Tree haul. I mentioned how I purchased candy corns for a recipe I was going to do. Well, let's just say it took a little longer than expected. I first went on the hunt for fresh tangerines. My local store did not have any so I purchased canned mandarin oranges. I see that I'm really starting to be a perfectionist, sorta kind of. I had a vision in mind. I had no issue finding the candy corns, I settled for the canned mandarin oranges and now I was on the hunt for clear glasses. I had no idea how hard it would be to find clear cups. I had in mind little small dessert cups. Typically, I could find a set at my local Homegoods. I went to several stores and only found regular glasses. I went to my local Dollar Tree to see if I could find the stemless wine glasses (I think that's what they're called.) They were out of stock. I was willing to settle for the clear plastic tumbler cups. I really wanted some without the rim my local Walmart didn't sell them. On a whim, I stopped at my local thrift store and found a super cute tasting set. Bingo! Just what I was looking for. If I were serving these to friends and family I wouldn't put them in a large glass. I wanted to present them how I would serve them. That's just me... One more thing. The cups do not have the candy corn topping because I found them after recording the tutorial. sigh. Thank you for reading my rant . I just want you guys to know that I really do appreciate you stopping by. Have a wonderful weekend. Tip: Refrigerate the fruit and add the whipped topping once you're ready to serve. PS: I have a short tutorial of me making them. I love simple and tasty recipes! I'll definattely use this as one of my many "lazy desserts"
Mm, these look fantastic! I need to make this for my daughter. Such a cute idea! Much healthier than candy, too :). Sorry to hear it was so difficult to find everything you needed :(. The whipped cream and sprinkles had me sold! And it's so healthy and simple, definitely gonna try it out. Amazing idea! I have been nervous about Halloween in the upcoming years when my little one gets old enough. I am very conscious about what goes into her body so this is a perfect example for me. Thank you! Ingenious! So simple and very eye appealing. I'm definitely making these for my kids and guest! What a fun idea! Kids will surely love this. These look yummy. Much better than their sugary alternative. These look so festive! Can't wait to give the recipe a try! This is sounds delicious! And a healthy way to be festive. Looks really good and very simple to make. I love that it's so simple. Great idea for a halloween or fall themed party. Those look too cute to eat. I bet they do taste magnificent though. I would love to try them. 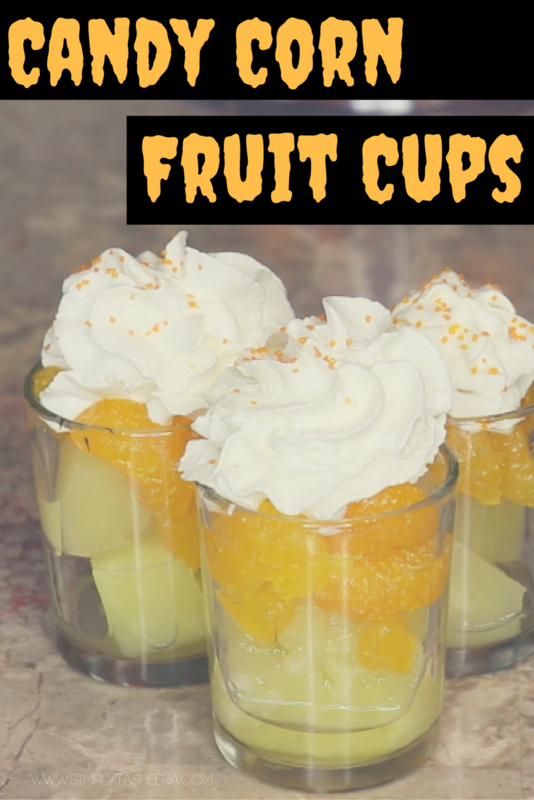 Fruit cups are a good alternative to halloween candy and treats. It's nice to have healthier options during this season and this looks amazing! This sure looks good. My twins and I love fruits but aside from just slicing the fruits up, I want to make sure that the food looks presentable for them too. This definitely fits my criteria! Love this! Very time for upcoming holidays! !